i'd like to refer to it as a meeting of great minds and in certain cases, it may well be, but mostly that is overstating the case. 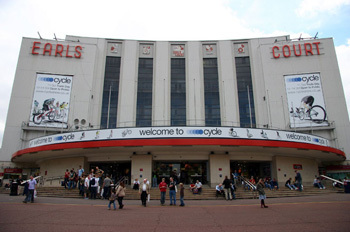 the annual cycle show at earls court starts for those of us in the press or trade, or both, on thursday when, ostensibly, collectively we trawl the acres of carbon, on the lookout for next year's big thing, already seen at interbike and eurobike, with which we can enthrall you in the coming weeks; or, in the case of the trade, what will be filling the order books in the months to come. that's certainly how my visits to the cycle show began several years ago. but as in every line of business, you meet people, you get to know folks, and an event such as this serves as an unofficial get-together. which of course it should in some ways, but definitely not to the extent of preventing the undertaking of the original premise. that's sort of what happened last year; i went with an ipod full of intentions and returned home with most of them intact and untouched. i believe the technical word for endless nattering and more espressos than can reasonably be thought necessary, is networking, and there is no doubt that such a collection of likeminded people in the one place can't help but improve communication between disparate objectives. and when you live miles from anywhere, you need to grasp any opportunity with both track mitts. but unlike previous years, when the routine has consisted of overnight to london, walk miles round earls court, and then overnight back to glasgow, 2010 will be different. a long day to be sure, and very likely to encourage a swift bout of train lag. this year, however, i have decided to have a shot at viewing bicycle life from the other side. while time wandering aimlessly around stand after stand of bicycle stuff, interspersed with talking for britain seems like an idyllic way to spend a thursday, spare a thought for those confined to the stands from thursday through to sunday. i did spare a thought for just those people, so much so, that i have decided, for one day at least, to join them for the first of the public days on friday. 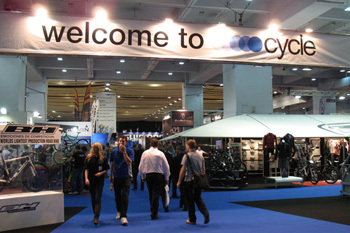 what sort of person visits the cycle show? are they just window shopping, or is there real intent to discover more prior to purchase? how hard is it to stand in several square metres of earls court from 9 to 5 telling people not to touch the exhibits, or to answer the same question for the forty fourth time in one day? if all goes according to plan, i'll be able to let you know by the weekend. the colnago shirt is packed, the catalogue memorised and i hope to see you on the colnago stand on friday. and while we're on the subject of shows in london, it would surely not be too unseemly to mention, in the same breath, the forthcoming bicycle film festival, hosted at the barbican centre from wednesday october 13th until sunday 17th. 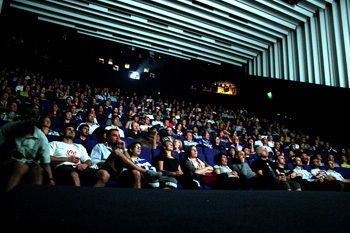 since the bff was started in the usa in 2001 by brendt barbur, it has not only gained in popularity, but in geographical locations; there are now 38 bicycle film festivals held across the world. there is little point in my listing the contents of the show one at a time when hyperlink technology exists. so if you care to click across to the bicycle film festival, you can avail yourselves of the menu at your leisure. sadly, one trip to london in a month is all that thewashingmachinepost budgetary constraints will support, so i will sadly be unable to attend the moving picture show, but do please drop by the colnago stand at earls court on friday and say hello. suffice it to say there will be no posts until at least saturday 9th, or perhaps even sunday 10th, depending on the extent of the train, bus and ferry lag. see you soon. i realise this is something that should have occurred to me a long time ago, but much of our cycling lives revolve around ritual. i may have unconsciously known this for a while, but the screaming obviousness of it has only just dawned; the admission does my credibility as a man about the peloton no favours whatsoever. the sunday ride is perhaps, in my little world, one of the more obvious rituals, almost religiously undertaken at the same time, same place, same channel every sunday morning, come hell or islay weather. many's the morning we should all have stayed comfortably tucked up in our sunday morning beds, but we stupidly risk life and limb at angles against the wind that all but defy gravity and trigonometry. however, that's not where things start; first off, there's breakfast. plate, porage oats, banana, pot, measuring cup, water, cooker, spoon, orange juice. satisfyingly fed, there's the munchie bar for the back pocket, rainjacket to keep it company, shoes, helmet, rudy projects and gloves. you can't deny it; the items may vary (slightly), but the ritual is the same, and mostly in specific orders of preference. but it doesn't stop there. the bicycle tyres must be checked for nicks, cuts and any small stones loitering about the tread, followed by the checking of pressures and most likely, a pumping up of the tyres. even those not involved in much of the foregoing will almost certainly adhere to the tyre pumping bit. admittedly, i may have become a bit of a sucker for the implied rituals engendered by reading books such as tim krabbe's the rider and the grainy photography of rouleur and those impressive little rapha catalogues that inhabit a musette in the cupboard. what would ben ingham do? the application of chamois cream has been a ritual for as long as i can remember (sorry if you're eating at the moment), but the arrival of that orange winter embrocation, coupled with the implied necessity by messrs dunn and staples, has added a further step before breakfast. and you know what? i love it. many a ritual is but one too many steps between anticipation and activity, but in this case, absorbing all those that are a part of becoming a virtual classics pro' are an enhancement to the object of desire; cycling. oversocks is somehow an ugly and vacuous word describing a practical and for some reason, stylish accessory to the would be dog in a hat. it may, at one time, have been a smooth extension to those shaved legs wearing bib-knickers, but with the endless variations in shoe closure systems now abounding, its profile is often topographically disturbed. 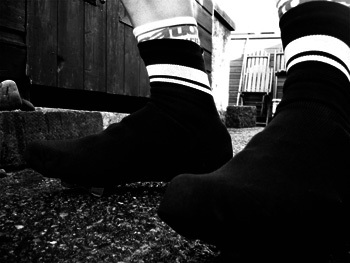 it is one of a triumvirate of shoe coverings; the thin polyester version which seems more akin to aesthetic pleasures than any serious use, and much beloved of vdb and occasionally david millar; the neoprene overshoe with a zip at the back and a couple of holes in the re-inforced sole, intent on keeping out the worst of the rain, snow and slush. the oversock (hate that word) provides a similar level of practicality as its neoprene sibling; warm and cosy with enough rugged fibres to last longer than a bikefood nut bar on a sportive. such is the impression and tactility promised by the new, de feet produced rapha variant. there is an ascribed score on the sole delineated by a thin grey line requiring the avid cyclist to cut his/her own slot that the cleat might meet with its pedal. why is it not pre-cut? cleat slot taken care of, it is a simple matter of pulling the sock on over whichever shoes are flavour of the day. i put my feet into a pair of bright yellow mavic zxelliums, because while their closure system is the envy of many, it seemed hell-bent on giving anyone's oversocks a hard time. the collar of the socks (can i refer to it in that manner?) is pure rapha: pink and white hoops, immediately transforming the wearer into a dean downing or kristian house body double (minus the speed and ability it must be pointed out). it is pure coincidence that the chosen sunday dawned sunny, blue sky and cold. 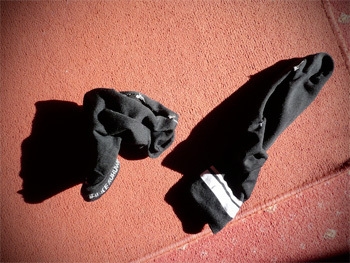 the ritual application of winter embrocation and black, white and pink oversocks simply laughed in the face of low temperatures. i deliberately walked about in circles, all the more to scuff the soles; there are no heel slots because spring classics wannabees do not partake of such distractions. it was disappointing to note that the velo club peloton did not notice anything untoward in my circular perambulations, but heartening to note that neither did the ruggedly re-inforced soles. not yet, at any rate. i'll get back to you at a later date when scuffing has become close to repetitive strain. they're not waterproof, but, almost an hebridean pre-requisite, they are completely windproof. if you, like me, are concerned at the thought of purchasing £20s worth of woolly shoe coverings, only to have to take a pair of scissors to them, i'm with you every step of the way. 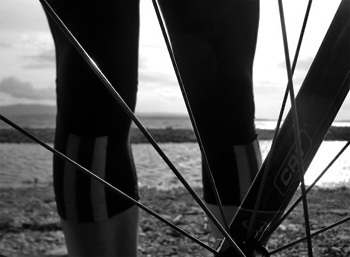 but it's a rite of passage that every aspirant must endure; a bit like gluing tubs. and be assured that this is what perren street intended you to do; there should be no worries over sniggering behind your sportwool at the wednesday evening ten. always more ritual is better than less. 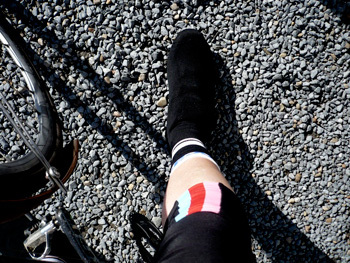 rapha's oversocks are available in medium and large, both in black or white at a cost of £20. friends of mine currently domiciled in edinburgh are shortly to 'up-sticks' and head off into the big wide world on their bicycles, surrounded by panniers and more often than not, living in a tent. don't deny you haven't thought about it at some time or other; now that cadel evans failed to restore a set of rainbow stripes in his home country, i wouldn't be surprised if he's thinking of the same thing. this is, as we are constantly reminded, and as brad's fave once sang, the modern world, so no trip into the hinterlands or conurbations of the planet would be complete without an accompanying blog; it's the modern way. in this case, the blog in question is entitled the sportswool diaries. conforming to a bout of pragmatic and common sense, warren and esther have heeded the oft passed advice, that the best time to have a website is when you don't need one. if that sounds like a strange consult, think of this: at present, the circulation of their blog across the interweb is minimal, which is the ideal time to practise one's writing and narrative skills, that when the planetary trip commences, not only will more be aware of its existence, but the level of storytelling will be commensurate with its import. warren is a far better photographer than i, so he really has no concerns on that front. however, in the best manner of a mutual admiration society, we have discussed our differing styles of scribbling; his slow and methodical, rounded off with a modest degree of self-admiration, mine fast and almost totally devoid of reflection. thankfully everyone is different. 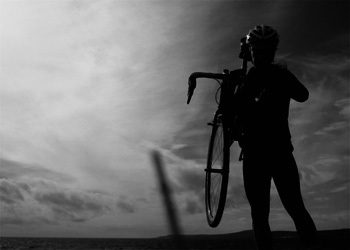 which brings me onto, in a rather roundabout route, the latest issue of rouleur magazine; number twenty. if you were not already aware, rouleur has severed the rapha apron strings entirely and fled the nest, a fact celebrated by the superb, almost surreal gatefold cover (above) entitled 'farewell to perren street' (rouleur is now ensconced in luke street, london). i would tentatively suggest that this is worth the price of admission alone. perhaps it will be made available as a poster sometime soon (guy?). but the connection here is with the opportunity for reflection on one's creative skills, as i must confess a degree of self-interest at this point; i have contributed several words to the issue in question. writing for publications and websites, including thewashingmachinepost, bears the onus of deadlines, some self-imposed, others from on high. being someone who couldn't be late for the party if i tried, the aforesaid rouleur words were turned in well in advance of mr edwards' deadline, proofed at point of completion and then (honestly), forgotten about, because there is the daily post to think about. thus when number twenty arrived through the letterbox, it was just like reading for the first time, apart from an overweening wish that i'd written bits of it differently (a common ailment). particularly when you consider the rather illustrious company overshadowing my meagre words (about freewheels, thank you for asking). the considerably more erudite herbie sykes takes pride of place with an extensive article about de rosa with photography by ben ingham. and just to compound my isolation in this issue concentrating on the bicycle, william fotheringham has expounded his thoughts on tubulars, matt seaton has words with cones, guy andrews sits on saddles and mike barry writes on the derailleur. rapha's japanese man on the spot, daisuke yano, combines with taz darling to educate us on perhaps one of the best kept secrets of the framebuilding world, yoshiaki nagasawa, and guy and taz have a look at san marco. for those who have followed the progress of rouleur from its now ultra-valuable issue one, the thud it makes on the welcome mat just under the letterbox has gained substantial decibels, almost entirely in the mid-range. this issue tops out at 162 pages, meaning that the ten pounds entry cost has begun to look like even more exceptionally good value for money. issue twenty will be on sale this coming week from rouleur.cc and an ever-increasing number of other sites, shops and cafes. i had no number on my back, i wasn't racing, and apart from a roadie going the other way, i didn't see onother cyclist the whole time i was out. you can't be too careful you know, particularly when the leaves have gone brown and fallen off the trees, the wind has gale force ambitions, and the mercury isn't rising. so i lathered on more of that orange tingly embrocation, wore bib-threequarters, and made sure the sleeves were long. cut me in half and it would surely say roadie all the way through, much like blackpool rock, but today i was an apprentice cyclo-crosser, expecting mostly all that that entails. and i pretty much got it. now there will be those of you who are dyed-in-the-wool crossers the minute october dawns, so i'd appreciate it if you'd keep the sniggers and guffaws to an acceptable level. fortunately most of the cantilever brigade i know well are in portland, therefore there won't be any of those embarrassing moments meeting any of them in the newsagents. offroad will do me fine, since aside from the very act of pretending cyclocross flows through my blood, there was work involved, the sum of which you will read soon in these very pixels. but first one has to assimilate a modicum of technique, for how else would value judgements be critically made from a standing start of ignorance? i have seen sven nys and his cohorts on cycling.tv, and it looks oh so easy; happen upon an unforeseen obstacle, and it's off the bike on the left, bike over the padded right shoulder (hup united: top tube goes here), negotiate, then throw the legs over the saddle and accelerate without so much as a skipped beat. if it's that easy to write, how hard can it be to execute? for starters, i am not used to pedals with such tiny cleats, and though that right leg swung over the saddle as the brake levers were squeezed, the left foot was a bit reluctant and a tad slow to release. gravity and momentum are not my friends. i have long wished to leap aboard in true cross fashion, gaining several lengths on my imaginary competitors; sadly it is still a wish unrealised. you see the saddle is too high for flapping feet to reach the ground, and finding myself uncomfortably asymmetric, balance was not my bedfellow. not quite in the cyclocross mode, there was no-one ready in the pits with a spare bike and power washer; only ten minutes into my off-road foray, and something was amiss at the front wheel. a puncture. on-road, despite the unkempt nature of islay's tarmac, i almost never suffer from such a malady, and neither do the rest of the peloton. does this happen to sven? with continued practise throughout the day, an approximation was getting ever closer, to the extent that i could get aboard from the rear while the cycle was travelling in a forward direction. sadly the travelling was not as fast as sven. has anyone else noticed that grassy surfaces are rarely flat? 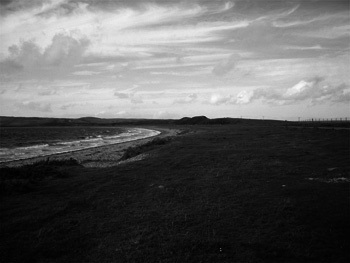 uiskentuie strand is either the islay cyclist's bete noir (headwind) or saviour (tailwind), though more likely it is both even when travelling ostensibly in the same direction. it's around 4km in length with the road separated from the shores of loch indaal by a strip of grassy sand dunes. when i have roadie writ large, i can impress even the more hardened pelotonese by my tenacity into a headwind, but that's on pristine tarmac. travel the same distance and vector, over grass, gravel, sand and loose stones, avoiding the occasional sheep and dog walker, and i now have serious doubts over my fitness. still, it amused the windsurfers trying hard to hang on to their sails in such a less than benevolent wind. after recuperating with a triple cappuccino (featuring a uniquely decorated surface) and a munch, i did it all in reverse; the direction that is. at every available opportunity, such as stopping to tighten those left crank-bolts (where's a decent mechanic when you need one? ), i practised leaping aboard; it's getting better, but my portland acquaintances would still be hard pushed to stifle their mirth. there is little or no danger of my pinning a number even next season; you just never know when i'll be called upon to shake that cowbell in 9/8. simon mottram and i have this tacit arrangement that we will never accede to anything that could conceivably be described as training. it's so unseemly at this time of life. so even though i haven't had this much fun since sprinting uphill on a colnago c59, my continued head-banging with tread and cantilevers will only serve to review appropriate velocipedes and associated componentry and clothing. honestly. no training, just smiling. rapha.cc | ibis cycles | crank bros.
as a small postscript, i have been very fortunate to have a short article posted on cyclosport.org (thank you sven and adam) which is illustrated with a photograph by the inestimable mike davis of pdxcross.com. this makes me very proud.